Are you a graduating awaiting NYSC mobilization? If yes, we are glad to inform you that the National Youth Service Corps (NYSC) senate list for the 2019 Batch ‘A’ protective corps members is out. The portal for verifying the senate approved mobilization list (2019 Batch ‘A’) of various institutions in Nigeria is now active until 9th March, 2019. 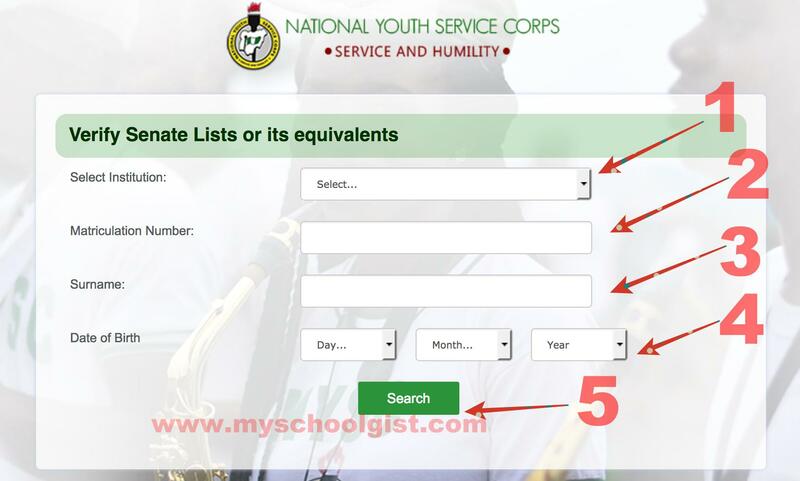 This is to inform all prospective corps members (2019 Batch ‘A’ ) that they can now check the Senate / Academic Board approved mobilization list of their various institutions on the National Youth Service Corps (NYSC) portal for free. See also: NYSC Batch ‘A’ Mobilization Exercise Timetable 2019 and NYSC Batch ‘A’ Online Registration Guide and Requirements 2019. How To Check NYSC Senate Approved List. Go to NYSC Senate / Academic Board list portal at https://portal.nysc.org.ng/nysc2/VerifySenateLists.aspx. Supply your Matriculation Number and Surname in the required columns. Select your date of birth. Finally, click the ‘SEARCH’ button to access your mobilization status. NB: Uploading of names is still ongoing. If your name is yet to be uploaded on the portal, your school might still be in the process of uploading. So you can keep checking back. Any complaint should be directed to your institution without delay. Scholarships and Opportunities for Nigerians. Please who knows when Absu(Abia state Uni) is uploading names, help a sister. I’m so tired of waiting. Any latest on Ahmadu bello uni. nysc list! Does that mean no remedy for going with batch A? I need help here please? My name is on the Senate list online but I can’t register they status is telling me to go and print result slip. I have done that yet is still saying the same thing. Pls.My registration is giving me tough time.Pls.help.in my senate it is written. Jamb registration number does not exist. The JAMB Reg Number does not Exist. (You cannot register, Contact your Institution) used by none. Please sir, my name has been uploaded in senate list for 2019 NYSC prospective corps members, but I am having a serious challenge here, the issue is that, I can only assess (check) it with my phone using opera mini as my web browser, but I can not assess it with laptop when using Mozilla Firefox as a web browser, and with this issue I can not continue with my NYSC registrations. Please Sir what can I do to sort out this problem before the expiring date of the registration will be elapse on the 19th march 2019. Thank you Sir! Has Uniosun uploaded her senate list? I tried to register but it is showing me no record. Pls what is the way forward.help me. Comment Text*Checking my name, but no record found. Comment Text*pls i want to know if IMO state polytechnic senate is out. Good morning, my school hasn’t uploaded our results on the nysc senate list, is there any chance of me going for batch A… i have mobilize in school but up till today 10th of march they haven’t uploaded our name on the senate list… can it still be uploaded. please who knows when IMSU will upload names?